Investing in palladium is much less common than investing in gold and silver. Each year, nearly 45% of the mined palladium comes from Russian mines owned by the Norilsk Nickel company, while roughly 40% comes from South African mines, making the palladium price susceptible to Russian and South African issues. The remaining palladium is largely derived from mines in the USA and Canada. A major demand for palladium comes from the auto-mobile industry, where palladium is used in catalytic converters. In January 2001, the palladium price almost reached $1,000 USD per troy ounce – a price hike largely caused by speculation on increased demand for catalytic converters. The Russian government controls a stockpile of palladium left from the Soviet Era. In the past, part of this stockpile has been sold off in large quantities, prompting in drop in global palladium prices. The current size of the Russian palladium stockpile is a state secrete. On the spot market, palladium is traded with the code XPD. When trades are settled in USD, the code is XPDUSD. 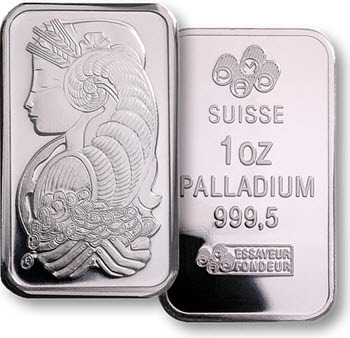 Major users of palladium is the auto-mobile industry, the electronics industry and the jewellery industry. The alloy marketed by jewellers as white gold consists of gold + at least one white metal, and that white metal is usually nickel, manganese, silver or palladium. In 2016, CPM Group reported that automotive use of palladium was increasing, partly due to a shift from platinum towards palladium. Growing Chinese car sales was also cited as a contributing factor to increased palladium demands. Platinum is used to reduce emissions in diesel-powered engines, while palladium is used for the same purpose in gasoline-powered engines. Because of this, an increase in gasoline-powered auto sales will translate into increased demand for palladium. Consumer demands shifting from small-sized cars to larger vehicles can also have an impact, since more palladium is required when the engine is larger. 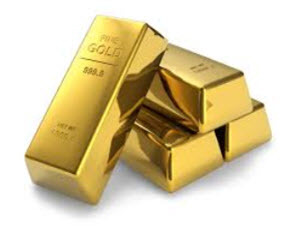 Examples of exchange-traded products that can be used to gain exposure to the palladium price are palladium exchange-traded options, pallidum exchange-traded futures contracts, palladium exchange-traded notes (palladium ETNs) and palladium exchange-traded funds (palladium ETFs). One example is the ETF Physical Palladium (LSE:PHPD) which is backed by allocated palladium bullions. This was the first ever palladium ETF. Another example is the ETF Physical Palladium Shares (NYSE:PALL). Palladium coins are much rarer than gold and silver coins, and the liquidity of the market is also poorer with larger spreads. The very first palladium coins in the world were produced as recently as 1966, when Sierra Leone issued their palladium coins. The following year, Tonga followed in suit with the Tonga Palladium Hau. The USSR (Soviet Union) minted the largest number of palladium coins. 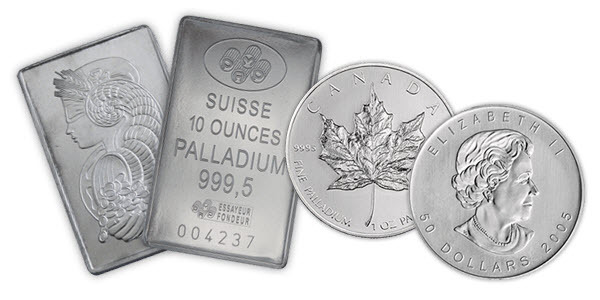 Other examples of countries that have minted palladium coins are Canada, China, France, Portugal, Slovakia, Palau and Australia. Several of these countries have only created special edition commemorative palladium coins in small batches. Examples of well-known palladium coins are the Canadian Palladium Maple Leaf and the Chinese Palladium Panda. The Royal Canadian Mint minted palladium Maple Leaf coins from 2005 to 2007, in 2009, and then resumed the minting again in 2015. These coins are .9995 quality palladium coins, which means that the palladium content is 99.95 percent. Each coin contains 1 troy ounce of palladium. Another example of Canadian palladium coins are the Big & Little Bear Constellations. Four versions were created, one for each season. 297 spring coins were minted, 296 summer coins, 296 fall coins and 293 winter coins. In 2010, the United States Mint was authorized to produce and distribute a one-troy-ounce palladium coin, but at the time of writing, no such coin has been created yet. The planned coin would carry a 25 USD face value. Palladium rounds look like coins but are not minted by a government as legal tender. The palladium content can vary. 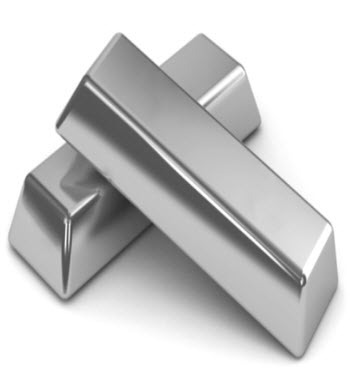 Palladium ingots used for trade at exchanges such as the London Platinum and Palladium Exchange must be assayed, marked, stored and transported in accordance with the rules of the exchange. Norilsk Nickel, a very large Russian palladium mining company selling both palladium powder and palladium ingots. Of all the palladium mined in an average year, nearly 45% comes from Norilsk Nickel. Norilsk Nickel is trading as LSE:MNOD and MCX:GMKN. Canada’s largest producer of palladium is called North American Palladium and operates the Lac des Iles mine in Ontario. The shares of North American Palladium is trading as NYSE:PAL. One of the major palladium miners in the USA is Stillwater Mining in Montana. This company is trading as NYSE: SWC. Public companies have their shares listed on an exchange, which typically translates into higher liquidity, smaller spreads and a stricter set of rules than for companies that are only traded over-the-counter. 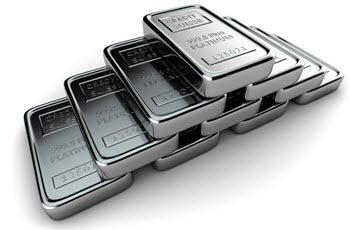 The most important over-the-counter trading centre for palladium is The London Platinum and Palladium Market (LLPM). The LLPM was founded in 1987, but can trace its roots back to the London Platinum and Palladium Quotation established by a group of metal dealers in 1973. The London Platinum and Palladium Market (LLPM) is not an exchange. Among other things, this means that the market offers more flexibility and confidentiality. Just as for most other precious metals, many palladium trades are speculative and carried out by participants that have no wish to make or take delivery of any physical palladium. A majority of all palladium trades at the LLPM are cash-settled or cancelled in advance. The palladium fixings are set by four LPPM members via telephone twice a day, Monday through Friday. The first fixing is set during the morning session, at 09:45 UTC (10:45 CET). The second fixing is set during the afternoon session, at 14:00 UTC (15:00 CET). The bid price is the price at which LPPM members guarantee that they will buy (good delivery) palladium. The LPPM bid price functions as a benchmark for global palladium prices. The LPPM Members are palladium/platinum producers, refiners, fabricators, manufacturers, distributors and large international banks. An member can be either a full member of an associate member. At the time of writing, the LLPM has 16 full members, of which ten are also market making members. The market making members are BASF Metals Limited, ICBC Standard Bank PLC, The Toronto-Dominion Bank, Credit Suisse, JP Morgan Chase Bank, UBS AG, Goldman Sachs International, Standard Chartered Bank, HSBC Bank USA NA, and the The Bank of Nova Scotia (ScotiaMocatta). The full members that are not market makers are Heraeus Metals Germany GmbH & Co. KG, Metalor Technologies SA, Tanaka Kikinzoku Kogyo K.K., Johnson Matthey PLC, PAMP SA, and Valcambi SA.